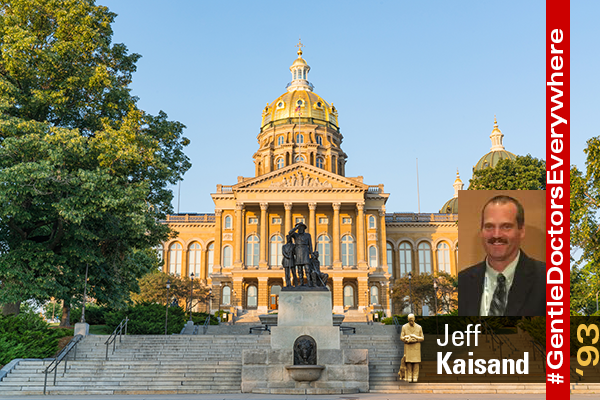 For the past five years, Jeff Kaisand as served as the assistant state veterinarian for the State of Iowa. Now with the retirement of Dr. David Schmitt (‘73), Kaisand has been named Schmitt's replacement as the state veterinarian. In his new role, Kaisand will lead the Iowa Department of Agriculture and Land Stewardship's Animal Industry Bureua which oversees regulation of animal movement, exhibitions, importation and disease eradication/control. "Dr. Kaisand's leadership as state veterinarian will help ensure the health and vitality of Iowa's animal industry going forward," said Mike Naig, Iowa Secretary of Agriculture. Kaisand native has practiced privately and spent 13 years working for the Iowa Select Farms. He and his family raise cattle and sheep on their farm.